Confidence in President Barack Obama remains high in Europe, Japan, Brazil and the U.S. Attitudes continue to be much more negative in predominantly Muslim countries, as well as Russia, China and Mexico. While many still hold Obama in high regard, general confidence in his foreign policy leadership has slipped by six percentage points or more in most countries since 2009. Moreover, on a number of specific policy issues, Obama has failed to live up to expectations. In 2009, many around the world anticipated that Obama would consider their country’s interests when making policy, seek international approval before using military force, act fairly when dealing with the Israelis and Palestinians, and take significant steps on climate change. Today, considerably fewer think he has actually done these things. Obama gets somewhat better marks for his handling of the global economic crisis, especially in financially troubled Europe (although the Greeks are an exception). And although reviews for Obama are generally less positive than when he first took office, at least a plurality in most countries would like to see him re-elected. In 11 of the 21 countries surveyed, people, on balance, continue to have confidence in Obama to do the right thing in world affairs. In eight countries, a majority or plurality expresses a lack of confidence, and in two, opinions are essentially divided. Confidence in Obama in almost all countries is, however, markedly greater than it was for President Bush in 2008. Solid majorities in most European Union countries continue to express a positive view of Obama, including seven-in-ten or more in Germany, France, Britain, the Czech Republic and Italy. His ratings are somewhat lower in Spain and Poland, where confidence has slipped by double-digits since 2009. In Greece, views of him are much more dismal than in other EU countries – just three-in-ten express confidence, while 68% lack confidence. Respondents in predominantly Muslim countries continue to have a low opinion of Obama, and the American leader’s ratings have slipped significantly since 2009 in the five Muslim nations where trends are available, including a 13 percentage point drop in Egypt. Confidence in Obama is somewhat higher in Lebanon. There are, however, large divisions among the country’s three major religious groups. While 51% of Lebanese Christians and 50% of Sunni Muslims express confidence, just 12% of Shia Muslims agree. Large majorities in Japan and Brazil have confidence in Obama’s foreign affairs leadership, as do most Americans. Attitudes toward the U.S. president are almost evenly divided in China and Mexico. In both nations, Obama’s ratings have declined significantly since his first year in office, falling 24 points in China and 13 in Mexico. Russians generally lack confidence in the American president, with just 36% saying Obama has their trust and 44% saying he does not. In India, 41% say they have confidence in Obama, though many do not offer an opinion. Despite decreasing confidence in Obama, he is still more highly rated than President Bush was during his last year in office. Obama’s reviews continue to be especially high relative to Bush’s in Europe and the U.S. The only country among those surveyed in both 2008 and 2012 where confidence in Obama is on par with Bush is Pakistan, where both men have received consistently poor ratings. 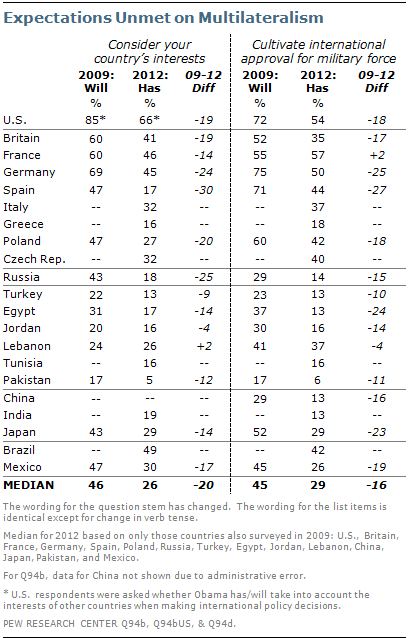 In 11 of 21 countries, ratings of Obama’s handling of the global economic crisis are on balance positive. As with other attitudes toward Obama, approval is highest in Europe, Japan and Brazil. 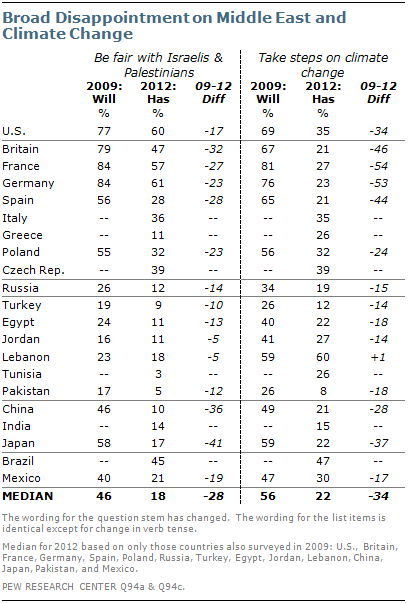 Greece continues to be the exception in Europe – a majority (60%) rates Obama negatively on his approach to the economy. Publics in Russia, China and predominantly Muslim countries all give the U.S. leader poor economic reviews. Obama’s ratings on the economy are generally unchanged since last year, although they have slipped somewhat in Japan (-12 percentage points) and Russia (-10). While many around the world still have a positive image of Obama, he has nonetheless failed to meet expectations on specific policies. For instance, in 2009, many publics anticipated that the U.S. leader would consider their country’s interests when making foreign policy decisions and would seek international approval before using military force. Today, relatively few believe Obama has done either. Roughly two-thirds of Americans (66%) think Obama has considered other countries’ interests when making policy decisions over the past three years, but few around the world agree. Obama’s best reviews in this regard are in Brazil, where 49% say Obama has considered Brazil’s interests. Publics in Germany and India are divided. In all other countries, opinion is on balance negative. And in 14 nations, about one-in-three or fewer believe Obama has taken their countries’ interests into account. These findings contrast sharply with 2009, when there were high expectations in many countries that Obama would act multilaterally. For example, three years ago, 47% in Spain said Obama would consider their nation’s interests; today, only 17% believe he has actually done so. There is similar disappointment with the way Obama has used military force. Half or more in only three countries – France, the U.S. and Germany – say Obama has sought international approval before using military force. Respondents in Europe are somewhat more likely than other publics to say he has done so, though there are significant gaps between what they anticipated from Obama on this issue and what they now believe. For instance, 44% in Spain think Obama has tried to get international approval before using force, but in 2009, 71% said they expected the new American president to act in this way. Clear signs of disappointment are present in other countries as well. In 2009, nearly four-in-ten (37%) Egyptians believed Obama would seek international consent before turning to military force; just 13% now think he has done so. Three years ago, 52% of Japanese expected Obama to get international approval; only 29% say he has. Obama has also failed to meet expectations on two other key international issues: dealing fairly with the Israelis and Palestinians and making significant progress on climate change. Three years ago, majorities across Europe and Japan, as well as four-in-ten or more in China and Mexico, believed Obama would be fair in his handling of the Israeli-Palestinian conflict. But today, just five of 21 countries have pluralities or more who believe Obama has been even-handed on this issue. The gap between expectations and current evaluations is greater than 20 percentage points throughout Europe. Fully 79% of the British surveyed in 2009 said Obama would deal fairly with this issue, but just 47% now say he has. Gaps are smaller in the predominantly Muslim nations surveyed, but that is because expectations were already low when Obama began his term. Today, less than 20% in all six predominantly Muslim nations surveyed think Obama handled the Israeli-Palestinian conflict fairly. On the issue of climate change, the gaps between expectations and evaluations of how he has done are especially wide. Almost all publics surveyed say that Obama has failed to significantly address the issue. Lebanon (60%) is the only country where a majority believes Obama has achieved this goal. Nearly everywhere else fewer than 40% agree, with the exception of Brazil (47%). The sense of disappointment is strongest in Europe. In 2009, 81% of the French polled said Obama would get the U.S. to take significant measures to control global climate change; just 27% believe he has actually done this. Roughly three-in-four Germans (76%) believed Obama would make significant strides on this issue, but only 23% now say he has been able to do so. Americans also think Obama has not performed as expected on this issue. Three years ago, 69% thought he would take major steps to deal with climate change, but 35% now say he has taken such steps. Despite widespread disappointment with Obama’s policies, pluralities or more in 11 of 20 countries hope Obama wins the 2012 election. However, fewer people around the world, especially in Europe, are now paying attention to the presidential election compared with 2008. Support for Obama’s re-election is especially high in Europe, Japan and Brazil – all areas where his image remains generally positive. About nine-in-ten in France and Germany think the U.S. leader deserves a second term. About seven-in-ten in Britain, Spain, Italy and the Czech Republic agree. Even in Greece and Poland, two EU countries with lower levels of approval for Obama’s policies, pluralities support his re-election. Broad majorities in Brazil and Japan do the same. Opinion is generally against Obama in most of the predominantly Muslim countries surveyed, with about half or more in Egypt, Jordan, Lebanon and Pakistan saying Obama should not be elected again. However, Tunisians are divided, and a 39%-plurality of Turks would like to see a second term. In many nations, a large number of respondents do not offer an opinion about whether Obama should be re-elected, which may reflect diminished international interest thus far in the U.S. presidential contest. Overall, attention to the 2012 election is down in most countries relative to the 2008 contest. Attention has decreased the most in Germany (down 20 percentage points), Japan (-20), Jordan (-17), Britain (-16), France (-16) and Egypt (-16). China is the only place where more respondents are now watching the U.S. election than four years ago (+19). In many countries, respondents with a college education are more likely to be tracking the presidential contest. For example, 53% of those with a college degree or higher in Jordan say they are paying close attention to the election, compared with just 29% of those without a college degree. The education difference in attention is also large in India (+24), Germany (+19), the U.S. (+19) and Tunisia (+18). Is Obama Out of Step with America on Foreign Policy?